Serve your guests these refreshing, vitamin C-rich detox shots this summer. Star anise makes this drink really soothing and flavorsome. 1. First de-seed and chop the amlas roughly. 2. Blend the chopped amla in a mixer till smooth. 3. 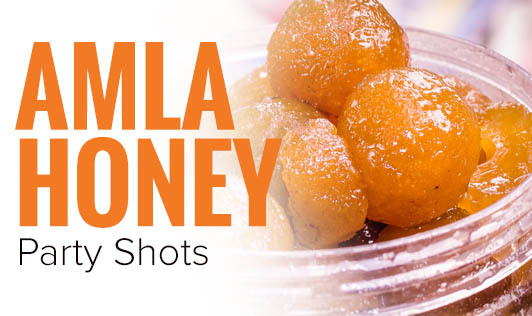 Combine amla puree, amla crush, star anise powder, and 1½ cups of water together. 4. Strain the liquid with a strainer and keep aside. 5. Combine the strained liquid and honey together and mix well. 6. Add crushed ice, strained amla juice to the mixing glasses and shake well. 7. Pour equal quanties of the chilled juice into shot glasses. 8. Garnish with fresh mint leaves and serve immediately. • Do not add too much star anise as it will overpower the flavors of honey and amla. • Use artificial sweeteners instead of honey to make it sugar-free. Also avoid using the amla crush as a sweetener. • Avoid straining the juice. • Storing the juice will destroy the vitamin C; hence serve immediately after preparation.